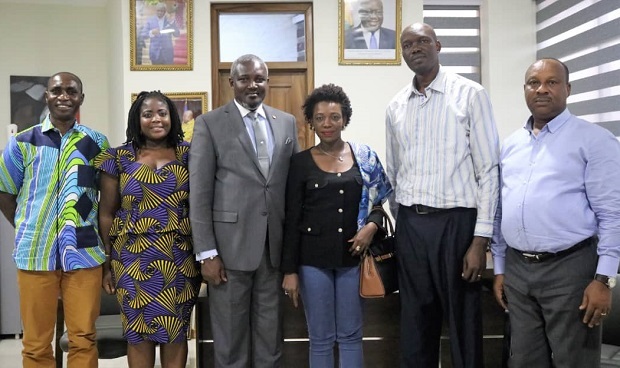 A delegation led by a United Nations Development Programme’s (UNDP) Economic Analyst, Ms. Sylvia Senu, has called on the Deputy Minister of Youth and Sports, Mr. Curtis Perry Okudzeto at the Ministry to discuss the Review of the Technical and Vocational Education and Training (TVET) and Youth Conneckt Programs. Briefing the Deputy Minister, Ms. Senu stated that the team is on a review mission which is part of the many set deliverables on the Youth Conneckt Program, whilst researching into the Technical and Vocational Education and Training (TVET)on the African continent. She noted that despite TVET’s long existence in Africa, there still abounds some challenges that needed to be addressed to serve the purpose of bridging the unemployment gap among the Youth. Mrs. Eya Nchama Blondine, a member of the team also indicated that there is a mismatch between educational curriculum and skills needed for a chosen career path. It is for this reason, she said the team has been tasked to critcally examine the TVET program, its oppportunities and challenges in a bid to develop the youth sector and plan a strategy with the use of technical skills. Welcoming the delegation, Mr. Curtis Perry Okudzeto expressed his appreciation to UNDP for making strides to address the myriad of issues affecting youth development on the continent. The Deputy Minister described the Youth Conneckt programme being spearheaded by the Rwandan Government as a brilliant initiative to address youth related issues. He noted that the challenge with Technical and Vocational Education and Training Programme (TVET) in Africa is with the branding and how it’s been packaged over the years. “Ghana changed its educational system by implementing the Junior and Senior High school systems to create an avenue for workshops to be constructed in the first and second cycle schools to train students. This meant that we combined theoretical and practical education to further equip students in their career paths,” he stated. Mr. Okudzeto disclosed that collaborations and discussions are currently ongoing to reposition TVET. He added that the Council for Technical and Vocational Education and Training (COTVET) has been set up by an Act of Parliament to coordinate and oversee all aspects of technical and vocational education and training in the country. This he said, would be under the supervision of the Ministry of Education. Mr. Okudzeto stated that one major stride made by the Akufo-Addo administration is the introduction of the Free Senior High School Program which seeks to take up the fees of students in the Senior High Schools as well as the Technical and Vocational Institutions. Present at the meeting was the Chief Director of the Ministry, Mr. Frank Quist, Director, Research, Monitoring and Evaluation, NYA, Rev. Frank Lartey Jnr. and Consultant at UNDP and Mr. Patrick Semmogerere.